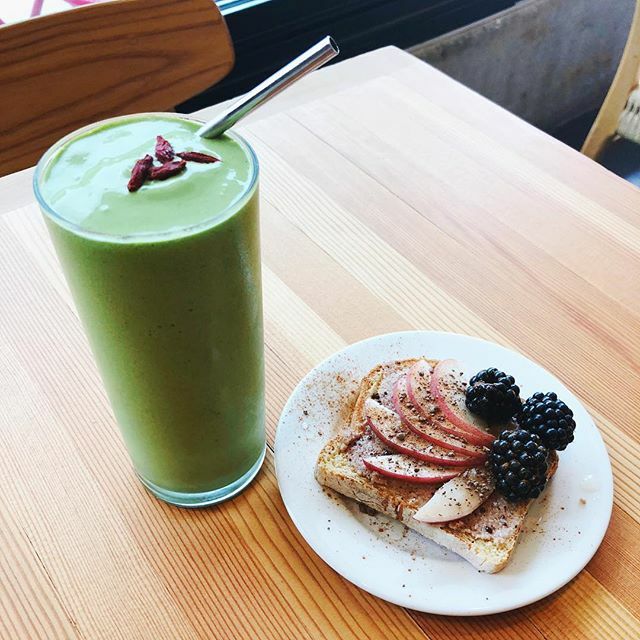 Next up in the “Breakfast, Lunch, Dinner” series is a guide to eating vegan in Portland, Oregon, brought to you by the lovely Chloé Lepeltier of Conscious by Chloé and Zero Waste PDX. Be sure to check out our other guides in this series. It is no surprise that Portland ranks amongst the best destinations for vegans. Stumptown is a pretty much veggie heaven. From dive bars and hipster brunch spots to pizza and sushi restaurants, and even cheese shops, it pretty much has a plant-based version of any dish you could think of. Don’t take my word for it and see it for yourself on this map of 50+ local spots offering 100% vegan meals that I’ve compiled since I’ve moved here three years ago. Tiny Moreso is a kickass feminist whole food café tucked into the Cully neighborhood. It was opened by the owner of the famous vegan cheesecake brand Rawdacious Desserts. Its menu features smoothies and juice blends with names like Gloria, Eleanor, RGB, and Bell as well as toasts, snacks and sandos more delicious than the last. Come for the cakes and stay for the activist vibe. Besides having the best set-up for a bathroom selfie , their only to-go option is a mason jar which requires a two-dollar deposit (#plasticsucks). Also, stainless steel straws! The St Johns Food Cart Pod is famous in the community for its many vegan offerings. 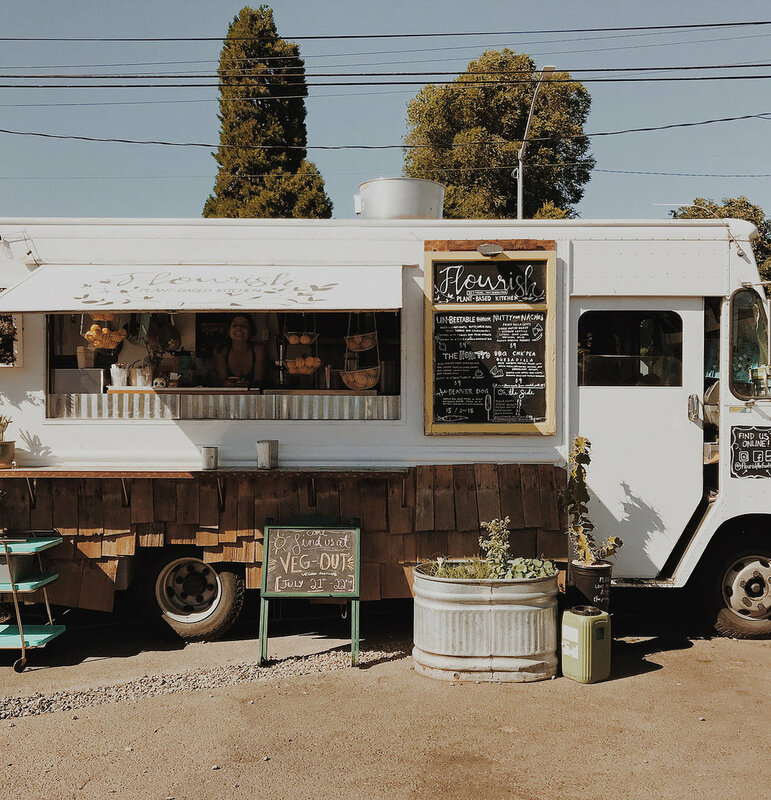 Located next to the St Johns Beer Porch, Flourish is a women-owned, 100% plant-based, gluten-free, from scratch food cart. Founders Hannah Perkins & Olivia Lenox’ passion for sustainability and mind-body connection translates into a fusion of authentic and comfort food made from plants. I always order the beet burger with an extra cashew mozzarella ball, but I might get tempted to finally try the carrot corn dog next time! HOT TIP: Meet your friends at the common tables and order food from the neighboring carts (vegan pizza slices, gyros, etc.) and share your dishes family style. End your meal with a delicious non-dairy ice cream from Beaux Berry. Tucked to the side of the Vtopia vegan cheese shop, Ichiza Kitchen & Tea House offers vegan pan-Asian fare & drinks. Ichiza means “one sitting, or the zen principle of stopping to contemplate one’s path.” As an advocate of the slow food movement, the restaurant offers small plates like chili oil wontons, kimchi gyoza and turnip cakes, as well as big noodles and rice bowls (with gluten-free options) which are aimed to be served in one sitting, allowing you to fully experience the pairing of our food and tea. I would recommend this intimate spot for a romantic evening with your sweetheart or a cozy night with close friends, sipping ancient oolong teas and sharing a plate of mochi. HOMEGROWN SMOKER : Vegan BBQ & Southern comfort food. VIRTUOUS PIE : Handcrafted pizza and ice-cream, made 100% from plants. Chloé Lepeltier is the author of the sustainable lifestyle blog Conscious by Chloé, and the founder of Zero Waste PDX, an organization whose mission is to inspire and empower companies and individuals to reduce their negative impact on the planet.